Radiographic testing methods may be used to detect discontinuities in welds for structural steel, petroleum piping, high pressure piping and pressure vessel welds. It may also be used as an investigative tool to determine the locations of suspected items in concrete walls, columns and elevated slabs. This method uses not only X-ray machines, but also radioactive isotopes which are much easier to use at remote job sites. This method will detect cracks, porosity, slag, incomplete fusion, and incomplete penetration in full penetration welds on pipe, pressure vessels and structural steel. Typical applications include welds in bridges, buildings, pipe lines, piping systems, vessels or tanks. Radiography will detect embedded items, such as conduits, reinforcing steel, post/pre-tensioned cables and panel boxes which are embedded in concrete up to two feet thick. 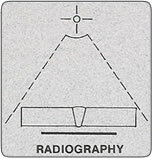 Radiography in generally performed at a time when the immediate area can be kept clear of all unauthorized personnel. Safety for radiation levels while exposures are being made is of particular concern and must be controlled at all times. Typical applications include full penetration moment connections in new construction and renovation projects and pipe welds. 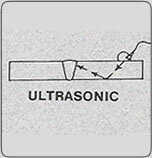 Ultrasonic testing is also used to determine wall thickness. Thickness testing is often used in conjunction with tangent radiography for the purpose of corrosion analysis. Ultrasonic testing uses ultra high frequency sound waves to detect flaws in pipe and structural steel welds by introducing the sound waves into the parent metal either longitudinally or at an angle. Typical deficiencies which may be observed are incomplete penetration, slag pockets, porosity and laminations in ferrous, as well as non-ferrous material. Ultrasonic testing provides a practical test method of weld examination for internal and surface discontinuities. This method may be performed in the field as easily as in a laboratory or shop environment. Magnetic particle testing is used for the detection of surface or slightly subsurface discontinuities in ferrous material only. This method is used to detect cracks, laps, seams, inclusions and other discontinuities on or near the surface of ferromagnetic materials. Magnetic particle testing may be applied to raw material, billets, finished and semi-finished materials, welds and in-service parts. Dye penetrant testing is used to detect discontinuities in non-ferrous materials which are open to the surface. Discontinuities may be cracks, seams, laps, cold shuts, laminations, through leaks and lack of fusion. This method is applicable to in-process, final and maintenance examination. This method may also be effectively used when examining non-porous, metallic materials, both ferrous and non-ferrous, and of non-metallic materials, sucha s glazed or fully densified ceramics, plastics and glass. Design by Affordable Web Design & Hosting, Inc.